My students love this lesson. 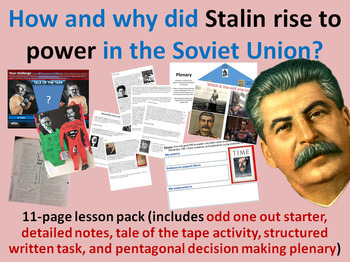 They begin with an odd one out activity designed to get them thinking about Stalin as the 'man of steel' before working their way through detailed notes. They then proceed to take part in a tale of the tape activity where they identify Stalin's strengths and Trotsky's mistakes/weaknesses. Following this students complete a piece of structured piece of writing before completing a plenary exercise in which they create a pentagonal plan of reasons which address the Key Question. I hope your students enjoy this lesson as much as mine do.